The 16th Death Anniversary of Doric de Souza fell on the 10th of Jan., an unsung hero born into a Catholic family. He was the son of the great nationalist Armand de Souza of Portuguese descend who migrated from Goa. Armand, like another migrant, the Tibetan Rev. Mahinda he was to play a significant role in the anti imperialist struggle of Sri Lanka. He belongs to the second rung leadership of the LSSP. He was not so well known like the leaders of the party, such as N.M., Philip, Colvin, Leslie and Edmund, because he worked mostly in the "underground". His father Armand de Souza was one of the early anti imperialist leaders of the country. Doric did not fail in the expectations of his father, the late Armand de Souza. Armand was a nationalist fighting to free his country from the tyranny of colonial rule. He as editor of the Morning Leader, "used his paper fearlessly in the cause of freedom of expression and in the defence of democracy", as his epitaph by a grateful public in Kanatte reads. 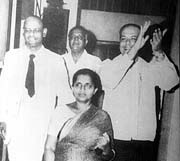 He was one of the founders of the Ceylon National Congress. He also had the distinction of having presided over the first trade union of the railway workers. His untimely death in 1921 at the age of 44 was a great loss to the nationalist and nascent working class movements of this country. Anthony Theodoric Armand de Souza took up the torch of liberty and the interests in the working class that his valiant father had bequeathed to his son. "Doric" as he was better known was born on January 4, 1 914. After a brilliant scholastic career at St. Josephs College, Colombo, he obtained a B.A. (Hons) First Class in 1934 and was awarded a scholarship and proceeded to the U.K. In 1937 he returned to the island and was appointed a lecturer in the English Department. He joined the LSSP and in underground work organising the cadres in the party. It was as a teacher of both Marxism and English that Doric excelled and was greatly respected. Whether it was a lesson, study class or an election campaign, he would treat them as equally important. He hated shoddy work and expected others to follow the same high standards that he set up and this was often why he had friction with others. It is said that he never took a days leave during 40 years of his teaching career. From 1939 the LSSP worked under semi illegality as the party was under surveillance, after it resolved that the ongoing World War 11 was an "imperialist war" and should not be supported. Doric was entrusted with the task of organising the partys underground. His cover name was "Moreira"
It was left to Doric to plan the escape. About April 1942 after the bombing of Trinco and Colombo there was the treat of invasion. It was the treat ideal time when there was general tension to put Dorics plan into action. Solomon, a jailguard had come under Phillip Gunawardenas mesmeric spell. Then there was Verrion Gunasekera, who had been the partys first secretary, now a frequent visitor to Bogambara Jail. Vernon had connections with Neville de La Motte, a jailor. (Mr. De La Motte was in later years Chief Sub Editor of the Daily News,) Solomon was requested to provide an impression to the main door key on a piece of soap. Doric had a duplicate made and this was kept by Edmund Samarakkoddy in his cell, hidden in the wooden casing of the electric wires, to be used when the orders from the underground came. This jail break was one of the most bizarre of escapades that one can come across in any revolutionary movement. N.M., Phillip and Colvin did even come out for a party conference and get back to jail, till the appointed date for the great escape! Even their wives were surreptitiously introduced to jail to be with their husbands for a few hours! On the "appointed date" Doric was in readiness with two cars outside the jail. Vernon Gunasekara enticed de La Motte to go for dinner and drinks on the "appointed date and time". Solomon opened the cell doors and walked out with the prisoners to the cars that were waiting, outside for their hectic journey to Colombo. He brought them to Colombo and hid them in several houses. His special charge was Colvin. Dorics next assignment was to smuggle them safely to India to join up with the elements of the Congress Socialist Party, for the formation of the Bolshevik Leninist Party of India. Shortly afterward he smuggled N.M., Philip and Colvin, in a vallam to safety in Rameswaram, while the British Police were looking for them in Colombo. Dorics cloak and dagger escape where the outwitted the CID and the police, would do credit to the pages of the novels of Baroness DOrczy. In 1941, Doric and Bernard Soysa went over to India to make contact with the left wing of the Congress Socialist Party. Both of them were arrested in Calcutta but released later. After organising the jail break, Doric went again to India in 1945 and was arrested with Karalasingham, this time in Bombay. Again after interrogation he was released. In a M.C. by-election to the Wellawatte North ward in 1946, he was, elected as the LSSP representative. By systematic and hard work, he became so popular that he was elected unopposed in 1949 to the same seat. He resigned in 1952 as he had to take up duties in Peradeniya as Senior Lecturer in the English Department. In 1957 he was elected to the now defunct Senate and remained there till 1969. In 1970 when the Coalition was formed he became Permanent Secretary to the Ministry under Colvin and remained as such till 1974. In 1969 he retired from the University as Reader, and took up an appointment at the Kelaniya University as Associated Professor of English in 1970, and remained so till 1982. Though his specialities were English Language, Literature and Semantics, he was a connoisseur of the arts too. He had a keen ear for music, and with a computer like brain and memory was able to whistle a whole concerto, without error. As a singer, he would often be the life and soul of a party. As a raconteur, he had few equals. Doric was a very good bridge and chess player. He could not tolerate job hunters, and he had to turn away many acquaintances and friends. Of the Shakespearean characters he was so familiar with Doric would best fit into that of Coriolanus; impatient, in transigent, full of passion, choleric, a mighty warrior, a devoted husband and father.